Now how is this done in Excel? Well actually there are various scenarios here to choose from but in this first post I will show the the easiest one. 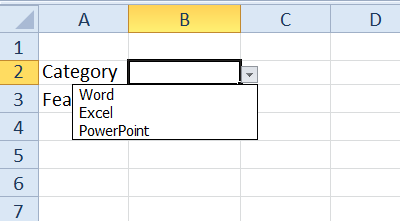 In a next post I will show you how you can use this in your forms created from VBA. What we are trying to accomplish is the following scenario. We have a cell where we choose a category option. In this case we would like to choose from the following options: Excel, Word and PowerPoint. Depending on the choice we have made we would like to choose from the following list the available features for that specific application. Ok ready to do this? Here we go. Now we have to ‘name’ the various sections. Let start with the category section first. Name the first selection [Category]. You do so by selecting “E3:E5” and then click in the Name Box and type Category. Mind you that no spaces are allowed in the name you are going to use. Furthermore you have to press the [Enter] key to add it to the names. Now place the cursor in cel “B2”. This will be the cell where we are going to create a ‘dropdown box’ to choose from which contains the categories. When done you will see a little arrow appear next to the cell. Click the arrow and your dropdown box should now show the three options to choose from. 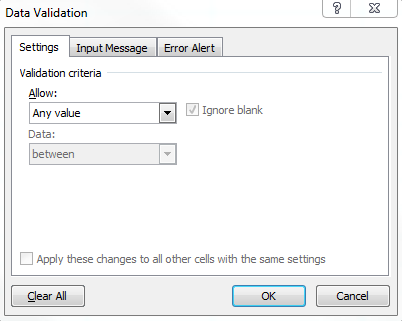 When clicking OK you will be notified that “the source evaluates in an error”. Click continue because that is a logical error because nothing has been chosen yet from the first combobox “Category”. The end result: ok, let’s try this. 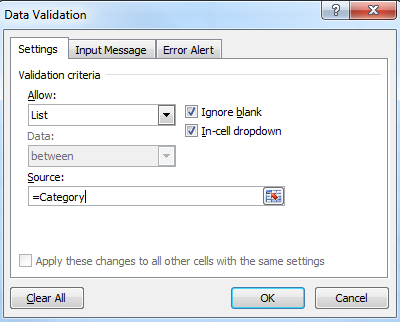 First select a category from the category list and then select an option from the features list. You will see that if you change the category that the features list will change to the options belonging to the categroy chosen. In a next blogpost I will show you how you can use this in a form in VBA and use the lists createdon a sheet. I will also show you how to use more combo’s being depended on others. 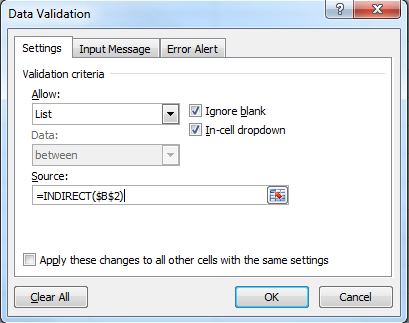 This entry was posted in Excel and tagged Excel; Listbox; Combobox;Depend on July 12, 2011 by Maurice. How do you handle it when your “Level 1” combo box item has a space in its name. Excel will not let you name a range with a space in it. Make sure the name you use doesn’t have any spaces in them. I use the underscore to create a visible space but in fact it isn’t there. So if you use [Group Notice] i will name that section [Group_Notice] and then you can refer to it. Let me know if that makes it clear for you otherwise i’ll try to explain with the examples i’ve made. Excellent tutorial! I just used this article to learn how to make these boxes for work, you demonstrated it very clearly. Glad to hear you found this useful!